Sweet acoustics for chocolate manufacturer with Hunter Douglas Felt Ceiling ..
HeartFelt®, the latest sustainable felt ceiling system from Hunter Douglas Architectural, has been specified to great effect on the new Brandmaster’s confectionary office block in Oosterhout Holland. The new facility, which houses offices, a boardroom, rest room, and cafeteria feature over 500sq metres of Hunter Douglas Architectural’s exciting new HeartFelt® ceiling system. Finished in seven different shades of grey and incorporating bespoke lighting strips fitted to the carrier system, the ambient feel and acoustic properties have been warmly welcomed by the company’s staff. 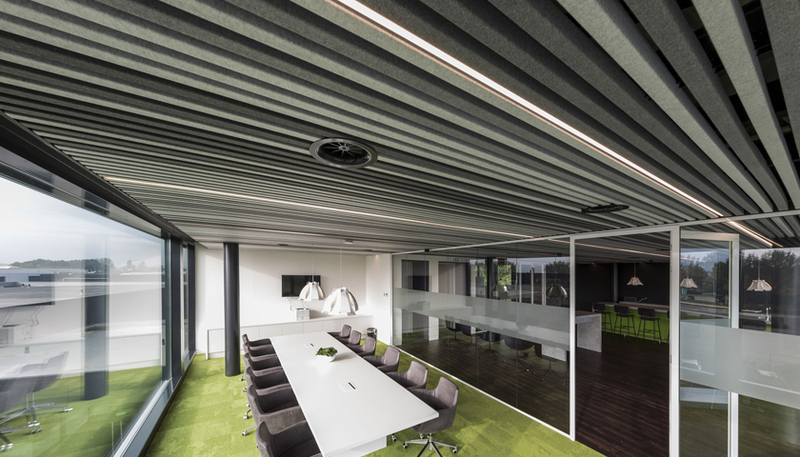 A recent winner of the Red Dot design award, the new HeartFelt® modular ceiling system is an innovative and sustainable felt ceiling product that delivers incredible acoustics and a unique modern appearance. Produced from non-woven thermoformed PES fibres, HeartFelt® is a linear felt ceiling system whose panels are manufactured 40mm wide x 55 mm deep and in lengths up to 6000mm. A wide choice of modules are available and the joint widths can be varied depending on the acoustic performance required. A standard carrier system provides ease of installation and demountability for access to the plenum. The HeartFelt® range has a C2C Bronze certificate is dust and dirt free and has recently been enhanced by the addition of five new earth tones. For more information on a HeartFelt® felt ceiling, please visit the website.